Skeptics of clean energy’s impact should consider Henry and Nancy Maier, the Allegany County couple who converted a charming, three-story farmhouse into their very own “green” paradise. The couple’s fully operational wind turbine system generates enough energy to power their 2,500 square foot residence with energy to spare. “The wind technology is expensive up front, so grants are really the key for us,” said Henry. The couple received a $10,000 Windswept Grant, which reduced the preliminary costs of the turbine system significantly. 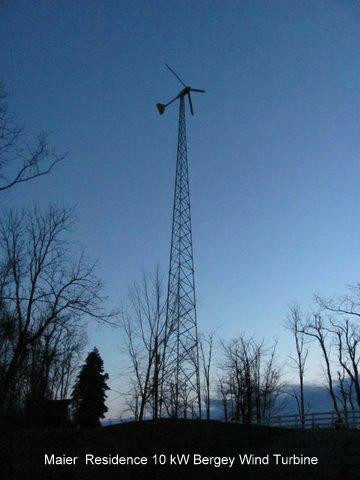 MEA spearheaded efforts to acquire and install a Bergey 10 kW grid-tied wind turbine, which generates electricity by harnessing 10 to 75 mph winds. Henry recalled his first energy bill after the system was active. Thinking a $4 electric bill was a mistake, he called his utility provider. Not only was the bill correct, but the Maiers had accumulated a credit of $100. In addition to enjoying free electricity, the couple earned $800 inMaryland Clean Energy Production Tax Credits. They claimed an additional $22,000 from the Federal government’s Residential Renewable Energy Tax Credit. The couple, part owners of LNH Enterprises, a renewable energy dealer in Oldtown, promote clean energy production in other ways as well. They plan to host a free grant-writing class this fall in Western Maryland to assist homeowners and small businesses in acquiring grants ranging from $2,500 to $20,000. “We plan to focus on the Maryland Windswept and solar grants programs,” said Maier. The couple is currently working toward installing a similar system on their business offices by spring 2011, and they will continue to work closely with MEA to make this happen. MEA’s Windswept Grant Program has granted $508,000 to Marylanders since its start in 2007, which helped install 61 wind turbine systems across the state or about 280 kilowatts of installed capacity. Get more information about the Windswept Grant Program. Get more information about LNH Enterprises at http://www.intogreenenergy.com. Get more information about the Maryland Clean Energy Production Tax Credit. Get more information about the Federal Residential Renewable Energy Tax Credit at http://www.dsireusa.org/incentives/index.cfm?State=US&ee=1&re=1.